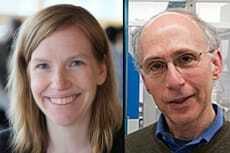 2013 NYSCF – Robertson Prize winner Dr. Amy Wagers and NYSCF Scientific Advisor Dr. Lee Rubin, both of Harvard University, published on their latest breakthrough in muscle and blood stem cell research. The team of scientists published two papers in Science, describing the ability of a protein, GDF11 – previously shown to make the aging hearts of mice appear more like those of younger and healthier mice – also improved brain and skeletal muscle function in aging mice. The research showed that injections of GDF11 increased the exercise capacity of aging mice as well as improved function in the olfactory area of their brains. This research has vast implications for new treatments and even cures for brain, blood and muscle disorders. The scientists expect human trials with GDF11 to begin in three to five years.